Happy Monday! How was everyone's weekend? This weekend we woke up early Saturday morning, got our coffee's, and drove to Cincinnati to go to IKEA! It was actually both me and Billy's first time there, and it was completely different than we both expected (not in a bad way, just different.) We got there right when it opened and were out of there within two hours, and that my friends is what I like to call a huge SUCCESS! We had both heard it could be overwhelming, especially when crowded, so our plan was to get what we needed and get out of the there. It wasn't crowded at all, actually, so we even had time to just browse everything else for a while too! Of course I had to pick up a few things not on our list as well. While we liked the store and got exactly what we went for, we weren't crazy about it and probably won't go back unless we find something we have to have. Afterwards, we met up with our friends from college Kelly and Tim (he played hockey with Billy in college and I met Kelly that way!) who live close by and they took us to an area in Cincy called Over The Rhine for lunch. We ate at Taste of Belgium and I was so excited because I have heard such good things about this place. Their food was delicious...and since I was missing my chicken and waffles from Poogan's Porch in Charleston, I had to give Taste of Belgium's a try! 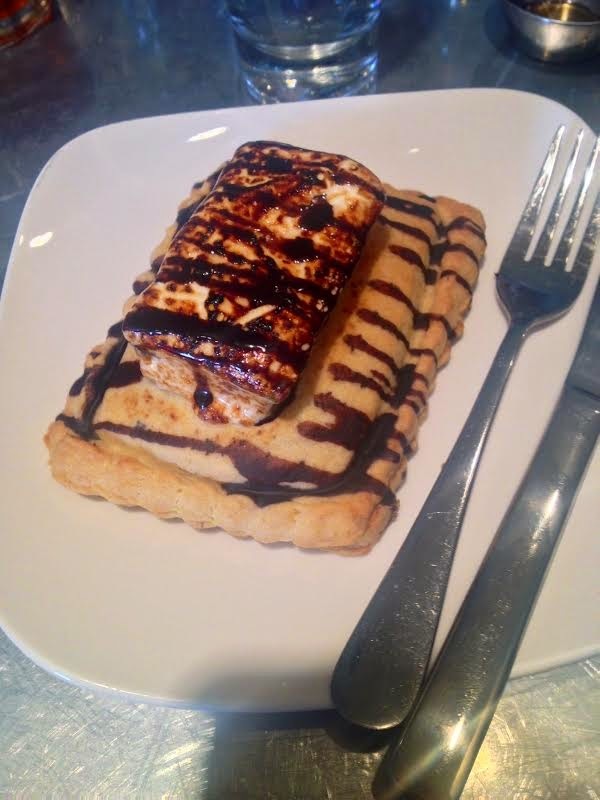 ...and somehow, I have no idea how, this s'mores pop tart also ended up in front of me. It was just as good as it looks, if you're wondering. Sunday consisted of errands and getting things done at the house...organizing, grocery shopping, gym, all the fun stuff. I did make this salad that I first saw on Julia's instagram and it was pretty much the most DELICIOUS salad I've ever had. 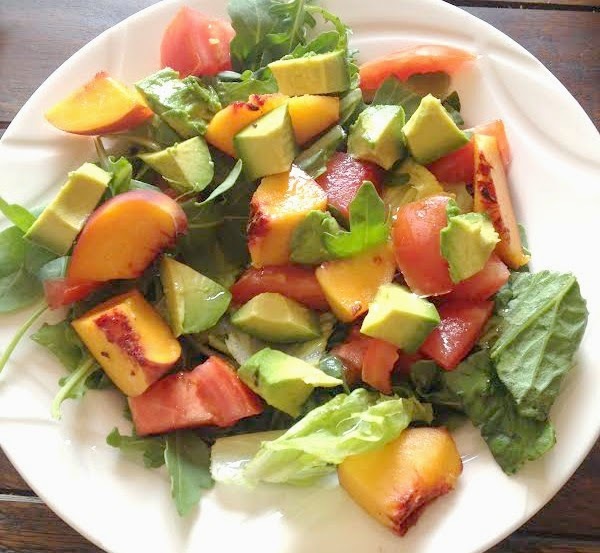 You guys have to try it...can't go wrong with peaches, tomatoes, and avocado. 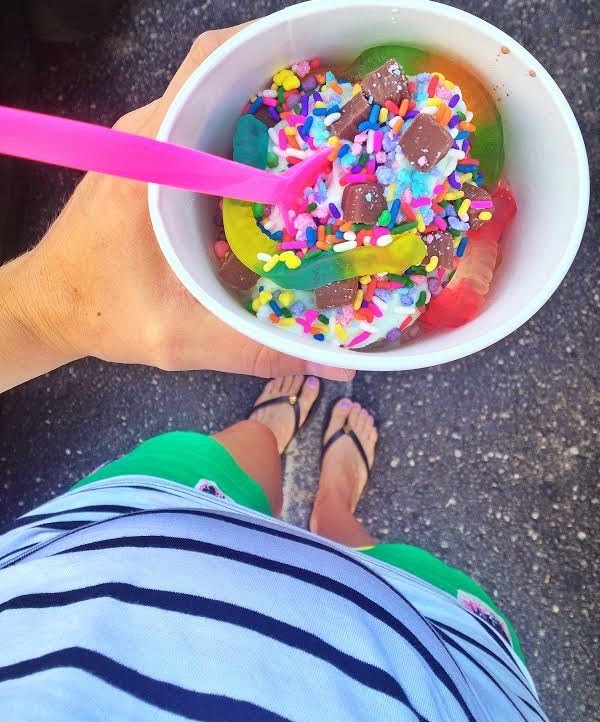 And last night we rented Divergent (loved it) and had a little froyo date. Successful and productive weekend I'd say. I can't believe Labor Day is right around the corner! How was your weekend? Are you a fan of IKEA? Ikea can be overwhelming, depending on where you are. The one in Orlando was always crazy. There are some really useful finds in there for organizing though! 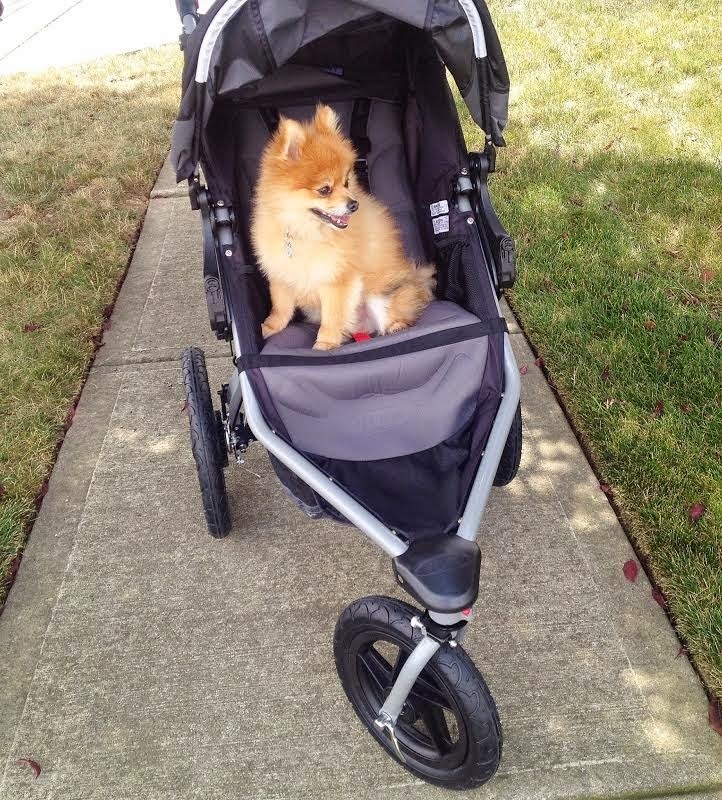 Love that picture of Rocky in the stroller, looking forward to the review! I think I narrowed down our stroller search but there are so many options, its tough! Every time I see that picture of Rocky in the stroller...I just have to smile! So cute! I only go to Ikea when I really need something. I don't tend to go just to "browse" but the closest one to me is in Cinci too. So it's not like I can get to one very often. I'm definitely going to have to try that salad too!! Sounds like a fun & productive weekend!! We may be making a trip to ikea in the coming weeks & I have a feeling we'll try to plan it like you & Billy did! Rocky looks so cute in the stroller!! I don't think I could get Bingham to do that - he's a scaredy baby! Lol! The Ikea closest to me is always packed. I'm sure if it was not as crowded, I might go there more often. Totally NOT a fan of IKEA. I have no idea why so many people love that store. I don't like how it's a maze to get around. Its like you cant go back and forth between departments. It's weird. I had my first experience last holiday season, and haven't been back since....just an odd lay out. Reading this post has made me huuuungrrryy! Looks amazing! IKEA is amazing, I should say, espiecially if you're on a budget an you're just moving in! Providing standard furniture- who's to stop you from making it your own? Visiting an IKEA is like Christmas to me. It's nice to 'plan' ahead and whoops out my inner interior designer. We have yet to make it down to Ikea. I'm not good with big stores like that, so I fear I might be completely overwhelmed. That salad looks amazing and I need to make stat. What kind of dressing did you use? You really can never go wrong with Taste of Belgium!! Dang.. in and out of Ikea in 2 hours. You. Are. Good. Can't wait to see what you got! And that smores poptart thing?! Umm.. sign me up for one of those! IKEA is much to big for my liking. I really liked the idea of the store while shopping for my dorm, but not so much as I got older. Those chicken and waffles look really good but I've never had the courage to order them...or fish tacos. I need to try both of these soon. I laughed so hard this weekend when I saw your picture of Rocky on Instagram! HILARIOUS. And PS - your chicken and waffles are hands down the most delicious I've ever ever seen. EVER. 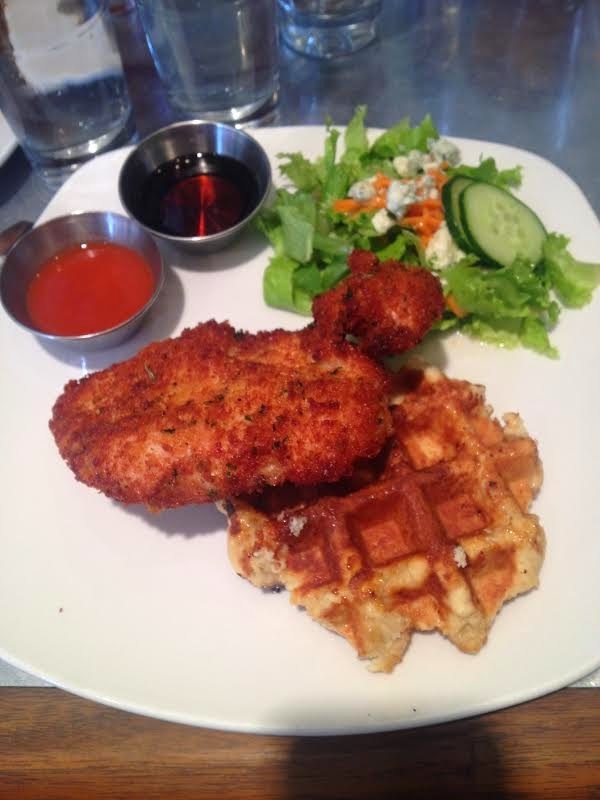 I've only had one really really good chicken and waffles dish at a local brunch place. Everywhere else has just been blah ok. But those look so YUM. You are speaking my language with the chicken and waffles and smores pop tart! That salad looks amazing too! Didn't you love Divergent? I think I watched it twice the weekend I bought it. I'm so ready for the 2nd one! Peaches are my jam right now!! Can't believe you were down here and didn't tell me!!! ;) Glad you guys found some goodies at Ikea though. I'm a fan of them... anything we've bought I've always liked and has held up for years now!